Over 247 million. That’s a great number. It’s the number of people that listen to radio every week. It is the top reach medium – touching more people every week than any other medium or device. This is something that we in the radio industry know. Being recognized outside of your peer group or industry is even better. Why? Simply because it is confirmation from an objective source. That is exactly what happened to radio. Pew Research Center is a nonpartisan fact tank that informs the public about issues, attitudes and trends across a wide array of topics and industries. 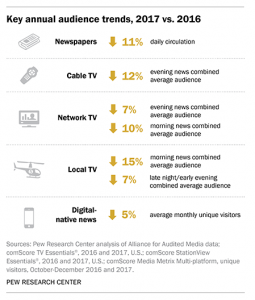 Recently, Pew Research released 5 facts about the state of the news media in 2017. Within these facts, they revealed audience trends across the news media sector. The only medium noted as not-experiencing declines, or better positioned as having a consistent audience reach was radio – “around 90% for at least the past nine years.” Each other medium noted within the release – newspapers, cable TV, network TV, local TV and digital-native news – had declines ranging from 5% to as high as 15%. Radio’s listening audience is growing. 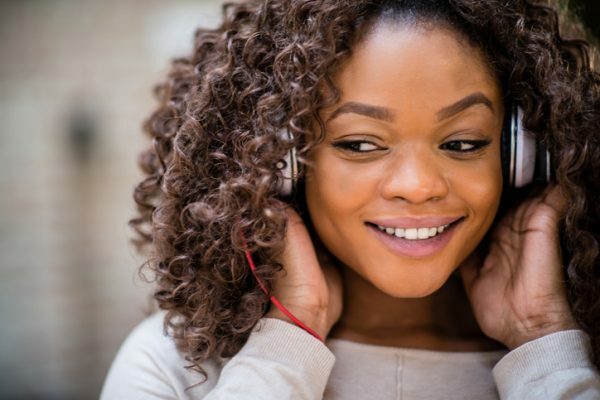 Radio reaches consumers on the go – wherever or whenever they want it – live or via streams, apps, podcasts and across devices like smartphones, tablets, laptops, computers, smart TVs or smart speakers. Radio has an emotional connection unlike any other medium. Sources: 1 Nielsen, RADAR 124 and 137, June 2014 and 2018, M-Su 24-hr. weekly cume P12+; 2 The Infinite Dial 2018, Edison Research/Triton Digital; 3 Jacobs Media, Techsurvey 2018; 4 Vision Critical/MARU, November 2017; 5 Nielsen Catalina 2014-2016; 6 RAB: Radio Drives Search, 2017, Sequent Partners, Media Monitors, Inf4mation Insights; 7 New Research/IAB, 2016. The most salient point? : “Radio delivers a $10 to $1 ROI”. Show them the money. There’s numerous systems, strategies, tactics and tools to track sales attribution and specific ROI from our radio campaigns for each advertiser, but most of our advertisers keep saying that our industry isn’t doing so. Doing so returns more sales/profit/commission per hour of prospecting/preparing/presenting/closing and servicing than not, so it’s in our individual and collective best interest to get started. As most people are afraid of change, let me freely pay it forward. I’d be happy to share any number of ways as to how it’s done. For those few of you already quantifying sales results for your clients, I’d love to engage in an exchange of ideas and approaches. Great news. We know it. All reps must make sure everybody knows it. Thanks Willie Wilson. Thanks Willie for your comment. There is so much great news about radio to share. Radio Matters! Previous Previous post: Radio on Main Street Podcast Featuring Tina Murley, Director of Sales for the Beasley Media Group in Boston. Next Next post: Radio on Main Street Podcast Featuring Kip Cassino, Executive Vice President of Borrell Associates.